The Canadian winter has announced itself, coinciding with American thanksgiving. Apart from a lot more time indoors and a significantly increased consumption of heavy stout ales, it signifies time to hunker down and concentrate on product development for awhile. Apart from the long list of apps and back-end algorithms that need regular attention and updates, one of the projects that is now getting increased attention is an app that is called the Green Lab Notebook, or GLN for short. The project actually got started some time ago, but has been put on/taken off the shelf quite a few times. Its existence is now a matter of public record, since I gave a talk in Germany about it earlier this month (GDCh, November 2013: slideshare). 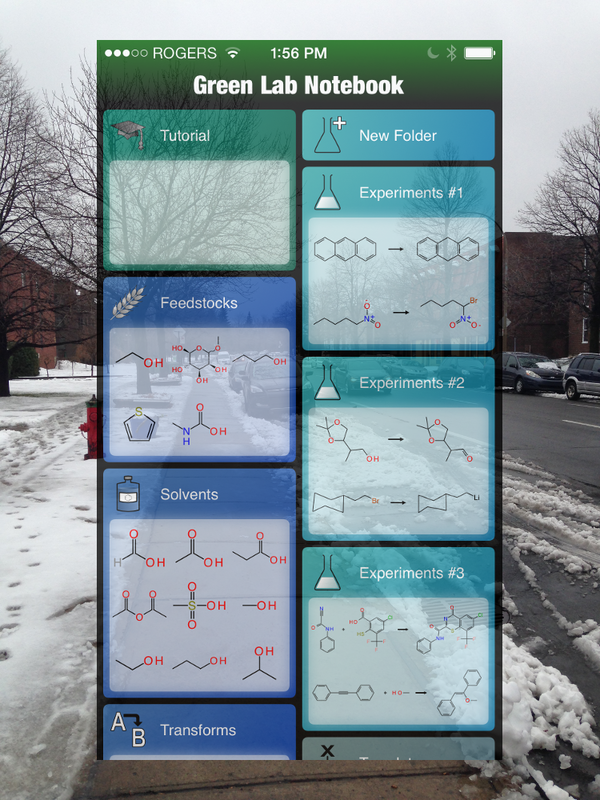 As the name of the app would suggest, it’s a lab notebook. In particular, it is reaction-centric, which means that its primary purpose is to describe chemical reactions, in all their raw cheminformatic glory. As supporting functionality, it also covers a lot of other areas involving molecules, and as the name also suggests, is intended to help with the practicing of green chemistry. The electronic lab notebook (ELN) software market is very active, and it’s one of the few areas of computational chemistry that is obviously growing rapidly (as opposed to being gradually smothered a little bit more each time pharma goes through another round of downsizing). There are lots of different types of ELNs: some are massive enterprise deployments designed for companies that that run their own Oracle databases and have a standardised desktop build; others are cloud-focused, for low overhead/small scale research groups; others are open source. Some have Windows-specific fat clients, some have cross platform web-enabled thin clients, and even one or two target mobile devices natively. What many of these products have in common, though, is being generic, i.e. essentially a rich text editor of some kind, that allows users to type in text, upload photographs, and bundle attachments of various formats. Essentially a science-branded equivalent of Evernote, and in a sense a more literal definition of the lab notebook metaphor: replacing freeform text and diagrams scribbled with a pen with freeform text and diagrams in a digital format. Or put another way, it’s like creating a file directory and stacking it full of Microsoft Word documents with arbitrary content. From a cheminformatics standpoint, though, this is not really very interesting. What is interesting is software that understands the meaning of the chemical data at the point of origin, by insisting that it be provided in a manner that is fully machine readable as the data is collected. For reactions, this means that the user interface has the operator enter the chemical structures of each of the reactants, products, byproducts, reagents, catalysts, solvents, etc., and mark them up as much as possible, by adding concepts like stoichiometry, quantities, yields, reference data, experimental procedures, characterisation data, and anything else that is useful and can be meaningfully captured digitally. Incidently, this is the way things worked back in the day when I worked on the precursor to the Accelrys ELN project (though I have no idea whether any of the bytes that I contributed still linger: for all I know, there could still be a little bit of me trapped in there). The distinction between a reaction-centric lab notebook and a generic pile of documents is that the software understands what the user has entered. If the user has entered it wrong, the software basically won’t work (e.g. if you don’t draw a product, the product will be not there, and the notebook entry is clearly incomplete, and the algorithm knows that just as well as does the human beholder). This is incredibly important when it comes to filing, validating and searching historical data: these are the oft-cited benefits of using lab notebooks. But it also opens the door to all kinds of useful value added features that kick in right away. For example, automatically calculating required quantities; making it easy to clone existing records for minor modifications; searching for and keeping track of compounds; looking up hazard information for ingredients or byproducts; looking up known reaction transforms… among other things. The app itself is partly complete, and far enough advanced that lots of screenshots can be created to give the illusion of functionality. The presentation that I gave recently (see slideshare) has a number of images for the various sections, and some wireframe diagrams for features that are still a bit hypothetical. I described the product as being 33.3% done, 33.3% based on technology already worked out for other apps (like MMDS or Yield101), and 33.4% vapourware. Even though most of the planned functionality has a direct precursor, and could in fact be largely cut’n’pasted, the Green Lab Notebook project has a special status, in that I’m making a special effort to refresh all of the underlying technology in the context of the lessons I’ve learned over the years (of which there are many), regarding what works and what doesn’t, for this whole mobile chemistry app thing. Keep an eye on this blog for feature updates as the individual pieces get built up.